Details: Please choose your customized kit from the drop down box above. The menu is arranged by fabric count for your convenience. Please note: if you do not already own the chart for which you are purchasing a kit - you must select that separately from the Charts By Artist page. If you would like floss bobbins or pins, please choose that option by ticking the box next to your choice in the list below the dropdown menu. If you do not make a bobbin or pin choice, then your floss will come to you pre-sorted on cards. Each card will have 14 colors with the symbol and floss number clearly marked. 2X1 means that you would use 2 strands of floss over 1 thread of fabric. 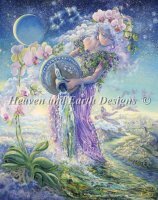 Thank you for your purchase of a Heaven and Earth Designs kit. We hope you will have many enjoyable hours of stitching! Where are we in the world?